What if I told you that you don’t think enough about your own death? Or the deaths of the people you care about? You’d probably be shocked, or maybe even offended. 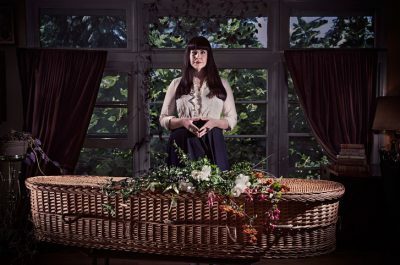 The fact is that most of us try not to think about those things if at all possible; however, author/mortician/natural deathcare advocate Caitlin Doughty definitely believes it should be on our minds more often. 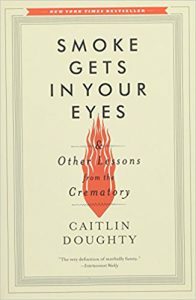 Smoke Gets In Your Eyes And Other Lessons from the Crematory is book that’s simultaneously funny, dark, inspiring, and sad. Doughty, a licensed mortician who has an “alternative funeral” business in Los Angeles, spreads the word through her YouTube channel and has written two books advocating for greater acceptance of death and dying and more natural and comfortable ways of dealing with our dead. Facing our own mortality is daunting, but Doughty argues that it’s necessary in order to get over fear of dying and to properly grieve our loved ones who pass before us. Being afraid of death to the point where it’s not polite to talk about it, she believes, is warping our society. The shift from death at home to death in a hospital – outsourcing it, if you will – means we have less contact with people who are dying and the newly dead. The sick person spends their last days or hours in a hospital. And even if someone dies outside the hospital, the body is whisked away ASAP to be embalmed and beautified cosmetically, to be presented later to the loved ones in a sanitized state. Doughty maintains that the impersonal attitude of the death industry (Big Funeral?) robs us of a profound human experience. She argues that only by getting in touch with our mortality and embracing that fact that death is part of life can we live life to the fullest. 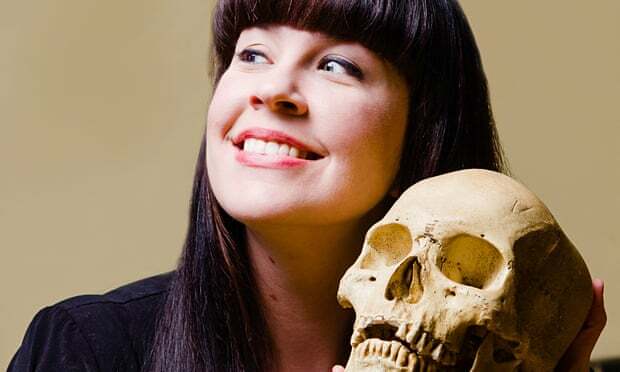 Caitlin Doughty came to her profession in a rather roundabout way. Finding herself in need of some kind of employment after getting her master’s degree in Medieval History (not many opportunities in this field, unfortunately), she was inspired her to act on her lifelong preoccupation with the macabre and apply for an entry-level position as an attendant at a busy crematorium in Oakland, California. To her surprise, she got the job, and it changed the course of her life. She found she had an affinity for the work as well as a growing interest in how we look at death and how we care for our dead. This eventually led her to attend mortuary school and become a licensed mortician with an alternative funeral business. So you might say that death ended up becoming her life’s work. Doughty relates her experiences as a crematory attendant with, as you might expect, an abundance of gallows humor – for example, when she describes coming home every night covered in a fine layer of ash that used to be people. And she addresses many of those “burning” questions about what really happens to the dead between the time when they shed the mortal coil and before they’re laid to rest. I was particularly intrigued by her account of what it’s like behind the scenes at a busy crematorium. As an inexperienced newbie, she became somewhat of a jack-of-all-trades. One of her duties was to retrieve corpses (in varying states of freshness) from hospitals, private homes, and the coroner’s office. Then once the deceased was in her care, she learned to perform all sorts of tasks like shaving the dead, sewing eyes and mouths shut, draining fluids out and putting in the salmon-pink formaldehyde/alcohol cocktail that makes them look “lifelike,” and eventually loading the bodies into the furnace, where they would go out in a blaze of glory. She certainly had more than her share of strange encounters, even stranger coworkers, and bizarre scenarios as she cared for the dear departed of every imaginable size, shape, age, and ethnicity. In her own candid and honest way but with a wry sense of humor, she demystifies the process of how dead bodies are handled, describing her job in very basic, down-to-earth terms. In fact, some of her descriptions may make you cringe a little, but the fact is that some variation on this is what awaits us all. It’s tempting to pick up this book simply out of morbid curiosity, but it’s not all just creepy details of fluids and embalming and burning corpses – a good deal of the book is focused on Doughty’s philosophy of life and death, which is an important message. Smoke Gets In Your Eyes is a fascinating memoir full of humorous, dark, and sometimes inspirational anecdotes. It’s also an insider look at some of what goes on behind the scenes in the death care industry – an industry that in modern times functions mostly behind closed doors. You might argue that this is progress – in the everyday lives of people in times gone by, devastating epidemics, infant mortality, and lack of medical care often brought death’s dark presence too close for comfort. Doughty, however, persuasively makes her case: We must embrace our own mortality (and that of others) if we ever want to be truly alive. In short, for anyone who plans on dying, Smoke Gets In Your Eyes is a must-read. 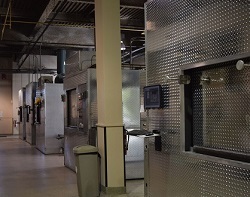 Want to learn more about how cremation actually works? Check out this article from July 2018. 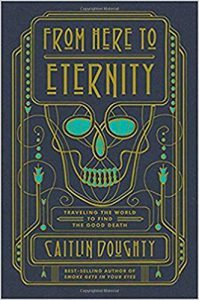 Doughty’s latest book is about funeral customs around the world, appropriately entitled From Here to Eternity. Hahaha this book sounds really fun and reminded me of a piece I did for a company I used to work for around Halloween. At the time I worked for a company that did marketing for plastic surgeons and to do something fun around Halloween I put some feelers out to see if anyone who worked in the funeral industry could share what happened to breast implants when someone dies. Through talking to one person who worked at a crematory, we learned that if they aren’t removed they basically become a pile of goo. We also learned that pace makers will explode if not removed. Pretty crazy stuff. Thanks for sharing about these books I definitely want to check them out.